Every modern company requires a professional waste management service that is designed to meet their recycling and waste disposal needs in a cost-effective manner. For this reason, Dial A Bin provide expert advice to help you streamline your current rubbish disposal process. Our aim is to help local companies better control their waste, with additional help from all kinds of organisations across the UK. Whether you want us to manage one large site or take care of multiple locations, our waste management team will advise you on business waste methods that don’t compromise cost or efficiency. Dial A Bin is the number one choice for residents, businesses and industries looking for efficient and cost-effective professional waste transfer management solutions. Our services range from collecting and moving waste, right through to recycling services. Our aim is to generate a high recycling rate on suitable waste products, and as nearly three quarters of waste disposal from commercial premises are appropriate for recycling and re-using, we are proud to fulfil our goals and help meet the government’s green targets. You can save time and money and still do your bit for the environment with eco-friendly waste disposal. Simply complete our form below and we will get in touch to see how we can improve your current waste management. 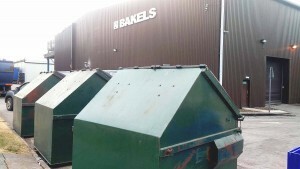 "Reliable weekly business recycling service"
Dial A Bin have been providing commercial customers with waste management and recycling services since 2001, enabling businesses to dispose of their waste in a cost effective and sustainable manner. Select a material below to learn how we can help your business. Our experts can analyse your waste output to develop recycling and disposal solutions tailored for you. As well as this, you can utilise our flexible delivery and collection service, working around your production schedule to provide the highest quality service for you. With a wide range of other waste containers for hire, including skips and wheelie bins ranging from two to 16 cubic yards, you can rely on us to supply the most effective system for you. For more information, please call our expert team or complete our online contact form. We are a member of the Road Haulage Association and carry out all services in accordance with regulatory legislation. Our full range of services extends across a wide area. Our main objective is to decrease the huge amount of waste that has been regularly sent to landfill sites, and drastically increase recycling to play our part for the community, and maintain first-class street cleanliness outside our clients’ establishments. We provide skips, wheelie bins or waste containers when required, and after the waste has been removed, we take it directly to the waste transfer station, where it is systematically designated for recycling or sent to a landfill site. Whether you have a regular waste transfer service or a one-off service, Dial A Bin guarantees that you will receive a prompt and professional service from start to finish. The team at Dial A Bin work with you to find suitable solutions to channel more of your waste into recycling and significantly reduce your current annual management costs. If you would like one of our experts to call you, simply complete this form below and we'll be in touch. * Information completed in this form will not be shared with any third parties.